Although Punxsutawney Phildidn’t see his shadow this year, you know spring is coming by the shift in your kids. They’re more restless, distracted and making plans—for summer vacation and the adventurous stories they’ll tell in school next fall. To give them a true story they can milk for months, spring is the time when a young parent’s thoughts should turn to thoughts of RV camping.RVing is more popular than ever because it’s more affordable than traditional travel, and it provides the freedom, spontaneity and connectedness that parents crave for their family. It’s also a great way to immerse yourself in nature with the comforts of home. Tents sound romantic to kids, but many parents fall out of love with the idea when they must sleep on the cold, hard ground and endure mosquitos and bears rummaging for snacks. For the ultimate camping adventure this summer, here are our 5 Best Tips for surviving and thriving the Great American RV Road Trip with your family. When taking an RV across America with your kids, we can’t emphasize enough the importance of renting the right RV. 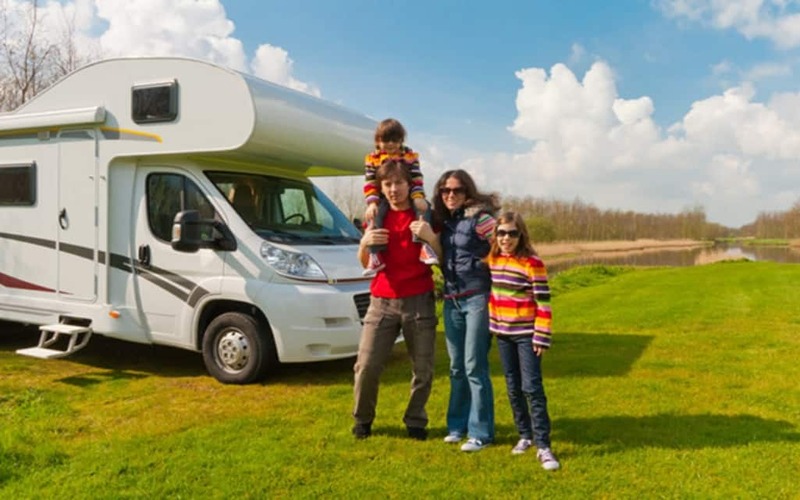 If you’re new to camping, we recommend families rent an RV for their road trip, so they get to experience it fully and learn their preferences before investing in buying one. You want to pick one that is small enough that you feel confident driving it, but large enough so your family can spread out and sleep comfortably. We recommend you rent from Mighway—RV Rental Marketplace because it’s the only peer-to-peer platform for RVs where you can rent from private owners and commercial renters—providing the ultimate variety. Owned by TH2, a partnership between the world’s largest RV rental operator (THL) and manufacturer (Thor Industries), Mighway—RV Rental Marketplace has decades of experience with guiding customers on how to rent an RV. Here’s a handy RV rental guide you can check out, or you can call and talk to a human. RV camping is an opportunity to teach your kids about the joys of simplifying your life by taking only what you really need. We recommend packing lightly and use soft carry-on bags for easier storage. Soft bags fit better, and if they fall down, they won’t become a safety hazard. You can rent supplies like dishes, pots and bedding if you don’t want to bring them.We do recommend you pack portable, healthy snacks they can keep with them, so they don’t try to get up and hunt for food while you’re driving. It’ll save you money on junk food on the road too. This won’t win you any popularity contests at first, but stay strong. What your kids need most, whether they realize it or not, is to connect with you and the present moment, which is impossible if they’re glued to their device. Play it old school and bring board games, share ghost storiesover s’mores, and explore cool wild trails and quirky attractions. Once they get over the withdrawal, they’ll thank you for memories they wouldn’t have if they were posting on social media all day long. Making an ambitious schedule is a fast way to go nowhere with your kids and your partner. Everyone will be more relaxed and inspired if you make frequent stops for spontaneous adventures or unique local museums, tours and activities.It’s more enjoyable for the parents too when you don’t drive and trip plan every day. While it may be tempting to go completely off the grid and stay only in national and state parks, those campgrounds don’t usually have hookups for electricity and water. These days the best RV resorts have really upped their game, providing everything fromclubhouses with game rooms and swimming pools to guided hikes, dining options, golfing, dog parks and family entertainment. It’s a great way to make new friends too! You can also recharge the battery and replenish your water tank, both of which can drain fast during a night without hookups. Everyone will appreciate the chance to enjoy upgraded bathroom and shower facilities, too. Also,the best U.S. RV parks offer access to some of the most exciting destinations, including top national parks, such as Yosemite, Joshua Tree, Death Valley, Sequoia, Redwood, Grand Canyon,Yellowstone, Glacier, Grand Teton, Great Smoky Mountains, Arches, Everglades, Guadalupe Mountains, Padre Island, Olympic, Zion and many more! With an open mind and an open road, there’s no end to the amazing possibilities and adventures your family can find this summer on an RV road trip. We hope these tips get you started on creating stories your kids will share with classmates –and maybe their own kids—one day!